What Factors Destabilize Free Radicals? EDIT: More caution is required than I had previously indicated regarding the main thesis of this post – that free radical stabilities are solely reflected by bond strengths. They depend on the stability of both reactant and reagent. Edits are indicated inline. For more discussion see bottom section. [ TL;DR – the general trends in this post are valid because we discuss bonds to H, but use caution when comparing any other type of bond other than hydrogen.] Thanks to Prof. Paul Wenthold (Purdue University) for his input. Over the last two posts we’ve been going through the factors which affect the stability of free radicals. The bottom line is that radicals are electron deficient and that any factor which either helps to donate electron density to the half-filled orbital, or to spread that unpaired electron out over a larger volume (a.k.a “delocalize” it) will stabilize the radical. It’s called Bond Dissociation Energy [BDE]. You might be familiar with it already! There’s probably a table of bond dissociation energies in your textbook, usually within the first 100 pages or so. The purpose of this post is to help connect the concept of bond dissociation energies with free radical stabilities. Let’s look at a quick representative example. Take two molecules – methane (CH4) and water (H2O). Which has the weaker bond to H ? Thinking back to some of the chemistry we’ve talked about earlier, such as acid base reactions, it might be tempting to say that O–H is weaker than C–H, since we can think of many strong bases which will deprotonate water [pKa = 15.7], but very few that will deprotonate alkanes [pKa = 50]. However when we look at the BDE’s, we see that HO–H is 118 kcal/mol and H3C–H is 104 kcal/mol. So the C–H bond is weaker? What gives? If you’re thinking about BDE’s and acid-base reactions, you’re using the wrong mental model. Acid base reactions involve heterolytic cleavage and BDE’s are a measure of homolytic cleavage. Instead of the stability of the ions [heterolytic] we need to look at the stability of the free radicals [homolytic]. Note how we’re forming a H radical in both cases. What’s different is the identity of the other radical. That leads us to comparing the stability of H3C• and HO• , and we learned previously that [all else being equal] the stability of free radicals decreases as we go from left to right across the periodic table, since O is more electronegative than C and that partially empty orbital is being held more closely to the positively charged nucleus. More on that below. If we keep one variable constant and vary the other variable, we can analyze the influence of structure on free radical stability. Here we’re going to keep H as the variable which is the same, and by examine the trends which influence free radical stability in a new light. 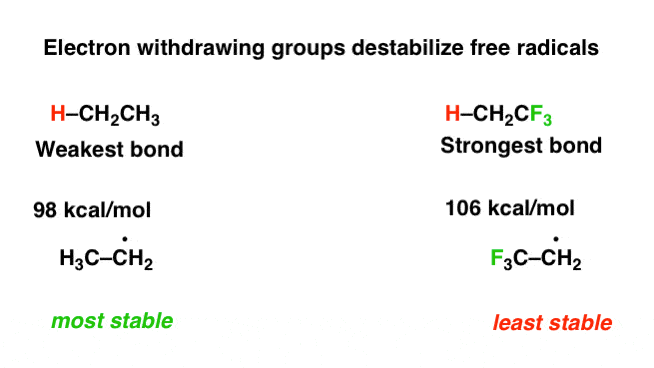 Adjacent electron withdrawing groups decrease the stability of free radicals. 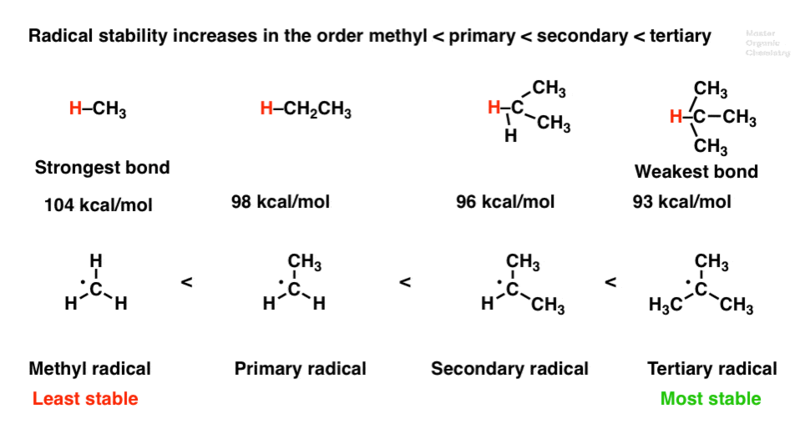 Note that the BDE of C-H bonds decreases as we go from methyl to primary to secondary to tertiary. They are easier to break since homolytic bond cleavage results in a more stable radical. Factor #2: Free radicals are stabilized by resonance. Note the difference in bond strengths between the (primary) C-H bond of propane and of the alkyl C-H bond of propene. The sizeable difference [~13 kcal/mol] is a reflection of the greater stability of the resonance-stabilized “allyl” radical. Although not directly comparable, look at the C-H bond strength when it is adjacent to two alkenes [76 kcal/mol]. This “doubly allylic” C–H bond is even weaker, reflecting the fact that a greater number of resonance forms are available for the radical species. Factor #3: Free radicals are stabilized by adjacent atoms with lone pairs. [This is a subtle point!]. Note the difference in bond strengths between the C-H bond of methane [104 kcal/mol] and that of methanol [95 kcal/mol]. In between we have the C-H bond of fluoromethane [101 kcal/mol]. Note that even though fluorine is more electronegative than H, the presence of the lone pairs on F is actually stabilizing relative to H.
Factor #5: Down the periodic table, free radical stability increases with increasing size of the atom. Look how the BDE decreases as we go from H-F  to H-Cl  to H-Br  to H-I . As we should expect by now, the iodide radical is the most stable, since the orbital is larger in size and is therefore “spread out” over a larger volume. further away from the nucleus, therefore “feeling” less effective nuclear charge than would a smaller atom. [thanks to commenter Xylene for this constructive suggestion]. Factor #6: The stability of the free radical decreases as the orbital is held closer to the nucleus. 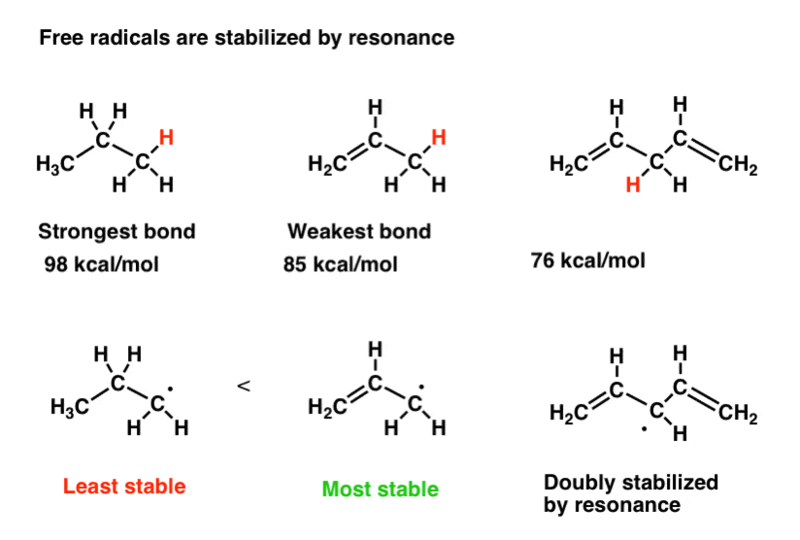 Look what happens to the bond strength as we go from ethane, which is sp3 hybridized [98 kcal/mol] to ethene [sp2, 109 kcal/mol] to acetylene [sp, 125 kcal/mol]. This is largely the same effect as #5 above – the farther away from the nucleus the half-filled orbital is, the more stable it will be. Factor #7: electron withdrawing groups destabilize free radicals. To isolate this effect it’s important to look at examples where the electron-withdrawing group cannot donate a lone pair to the radical (see factor #3). One good example is comparing the C-H strength in ethane vs. trifluoroethane. Hopefully it’s clear by now that by examining bond dissociation energies, we can discern trends in free-radical stabilities. This will be of prime importance in understanding selectivity in free radical reactions: “which free radical forms?”. A subtle point is that it is also important in understanding fragmentation patterns in mass spectroscopy, but we’re not there yet. Next Post: Radical Reactions – Why Is Heat Or Light Required? Using the bond strengths (BDE’s) of unstrained bonds to hydrogen is a reasonable method for discerning trends in radical stabilities, as discussed in this post. However, BDE’s in and of themselves are not reliable for discerning absolute radical stabilities in cases where the bond may be weakened by strain, repulsion between lone pairs, or other factors. For example the BDE for hydrogen peroxide is 51 kcal/mol, which does NOT imply that the HO• radical is stable, but rather that the O–O bond is destabilized by repulsion between the lone pairs. Regarding factor #5: Is it quite right to say that the radical is more stable because it’s more spread out? After all, the closer an orbital is to the nucleus (lower quantum number or increasing effective nuclear charge), the lower its energy (i.e. the higher its stability). Technically speaking, this would mean that all else being equal, a radical with the lone electron in a large orbital (further away from the nucleus) would be more unstable than a radical with a lone electron in a small orbital (closer to the nucleus). I believe the real reason at work here has the same basis though. Iodine has much larger orbitals and thus forms weaker bonds to itself simply because overlap isn’t so efficient. The weaker the bonds broken, the more stable the radicals formed (relative to the reactants). On an absolute scale though, I think a chlorine radical would be more stable than an iodine radical – it’s just more unstable relative to chlorine. A similar point can be made for factor #6: sp and sp2 C-H bonds are just stronger than sp3 C-H bonds. A radical with an electron in an sp or sp2 orbital will probably be more stable than a radical with the electron in an sp3 orbital, on an absolute scale, but relative to the reactants, the order is as you’ve stated. Mmm…actually in retrospect I’m not so sure how much “absolute reactivity” matters. After all, chemical equilibria are all based on energy *changes*, i.e. relative energies. So a chlorine radical is still going to be more reactive than an iodine radical (assuming it attacks another Cl atom) because the energy difference between the chlorine radical and dichlorine is higher than that between the iodine radical and diiodine (ignoring kinetic factors, of course). Inherent in that is the problem that the chlorine radical doesn’t always attack another chlorine atom, and the same goes for the iodine radical. But I suppose you can use the strength of the Cl-Cl or I-I bond as a rough gauge of the bond energy between Cl and another atom (say hydrogen) or between I and another atom. Absolute stability is a bit of a red herring, what I’m trying to say is that there is not a 1:1 correlation between the differences in bond enthalpies and differences in radical stability. However, as you say, it is certainly a rough (qualitative) gauge and good enough for our purposes here. hi I’m feeling a bit confused after reading the article and your comment. So is Cl radical more stable or iodine radical? Or does it depend much on the reacting environment? I would be grateful if you could explain this in more detail. Thanks! The H-I bond is weaker, so the iodide radical is more stable. The H-Cl bond is stronger, so the Cl radical is more unstable. Does that make sense? I think I have a reason for why H-NH2 is anomalous. It’s the same explanation why N has near zero electron affinity instead of a positive one. When the .NH2 radical is formed, since radicals are electrophilic, you would expect it to gain an electron to form the NH2- ion. However, the electron does not want to pair up with another electron since it will increase electrostatic repulsion between them, so .NH2 isn’t particularly reactive since there’s that energy barrier. As for O onwards, the added protons increase electron attraction such that it is no longer problematic. The electron affinity trend of radicals is CH3<NH2<OH<F as can be seen on the NIST Chemistry Webbook. The reason N has a negative electron affinity is because it has a semi closed shell structure. I think the effect between C and N in factor 4 is due to geometrical relaxation as a consequence of change in hybridisation. Both carbon and nitrogen goes from sp3 in the closed shell molecule to sp2 in the radical. Carbon has three hydrogen atoms to rearrange whereas nitrogen only has two. If the energies of the methyl and amino radicals were to be calculated in fixed geometries (still sp3 hybridisation) I think ammonia would appear to have the higher BDE. Here, having what would typically be a electron withdrawing atom (e.g., F, OH) with lone pairs attached to the radical is stabilizing. That is, it is electron donating through induction. But, when dealing with acidity, these types of atoms connected adjacently to a carbanion in say the conj. base of methyl would stabilize the excess negative charge. How is it that in this context with radicals, F with lone pairs stabilizes the radical through donation but then withdraws electron density to stabilize a negative charge? Re: your first paragraph it is NOT electron donating through induction. Re: your third paragraph – To really discuss this issue, we’d use molecular orbital theory to show how donation of a lone pair into the half-filled orbital is a stabilizing phenomenon, which lowers the energy of the radical. It turns out that the donation of the lone pair is more stabilizing than the removal of electron density via induction. 2nd paragraph last – this phenomenon does not occur in anions, because there’s no empty (or half-empty) orbital to accept the negative charge. That’s why stabilization of negative charge on a carbanion by electron withdrawing atoms such as F is purely an inductive phenomenon. Just thought I’d add that in our course it is taught that both EWGs and EDGs stabilise radicals, because of the increased stabilisation of the electron orbitals. It is even more preferred if both groups are present – captodative. Comparing CH3CH2 to F3CH2 is not appropriate as methyl groups are ED. You’ll notice the EWG I chose is *not* captodative [for exactly that reason : – ) ] . My point was merely that CH3CH2 was more stabilizing than CF3CH2 . 4 and 7 say the same thing, so we only need 1 reminding us about electronegativity. 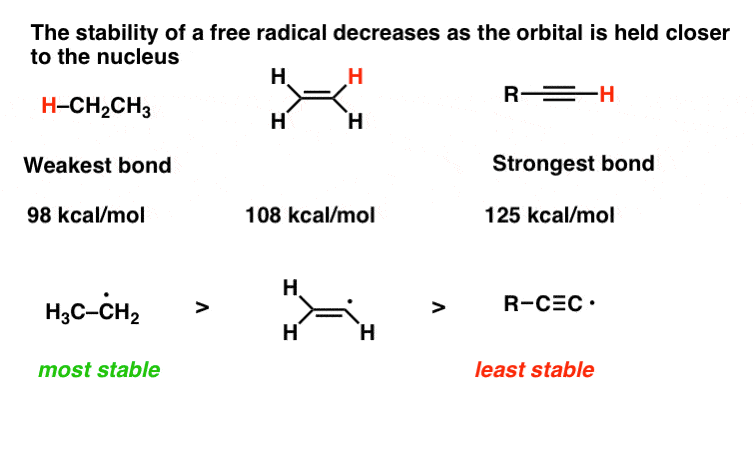 Firstly: free radicals decrease in stability as we reduce the amount of hybridization? This seems totally counter intuitive; you’d expect that sp would be much more stable because the radical is closer to the nucleus due to 50% s character… why is this? Secondly: adjacent lone pairs stabilize a radical? woah, this one totally blew my mind; you’d expect electronic repulsion/increased electron density to destabilize the radical?